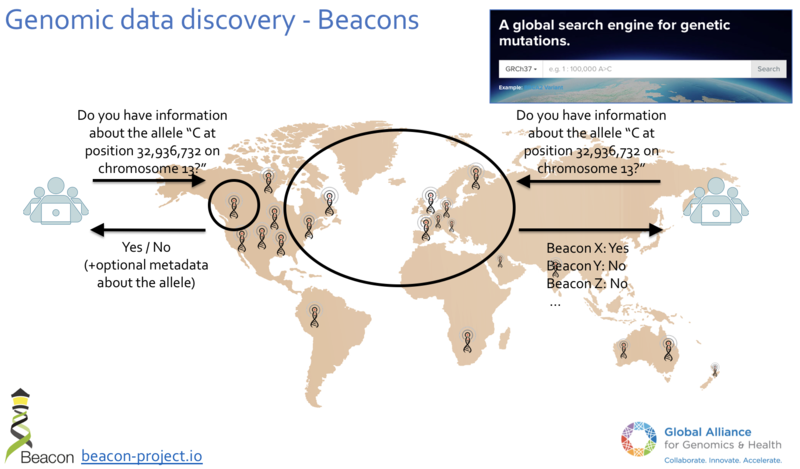 “Beacons” provide discovery services for genomic data in ELIXIR and the Beacon network, using the Beacon technology developed for the Global Alliance for Genomics and Health (GA4GH). The Beacon protocol defines an open standard for genomics data discovery, developed by members of the Global Alliance for Genomics & Health. It provides a framework for public web services responding to queries against genomic data collections, for instance from population based or disease specific genome repositories. A site offering this service is called a beacon. Such sites can scale through aggregation in the Beacon Networks, which distribute single genome queries among a large number of international beacons and assemble their responses. Recent and future versions of the Beacon protocol expand the original concept by providing a framework for querying other types of genome variation data (i.e. range queries and structural variants since v0.4) and also options for quantitative responses. Since 2016, the development of the Beacon protocol has been provided through the ELIXIR Beacon project, a GA4GH driver project, with ongoing participation from the DNAstack team.